The history of this era is complex; the cultural impact extraordinary. 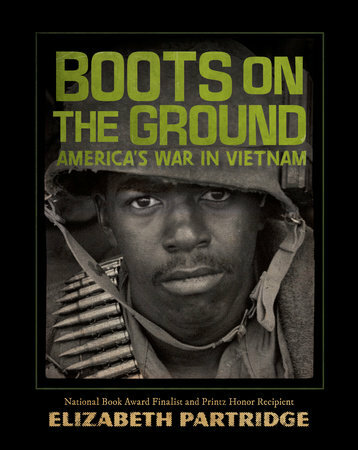 But it's the personal stories of eight people—six American soldiers, one American military nurse, and one Vietnamese refugee—that create the heartbeat of Boots on the Ground. From dense jungles and terrifying firefights to chaotic helicopter rescues and harrowing escapes, each individual experience reveals a different facet of the war and moves us forward in time. Alternating with these chapters are profiles of key American leaders and events, reminding us of all that was happening at home during the war, including peace protests, presidential scandals, and veterans' struggles to acclimate to life after Vietnam. With more than one hundred photographs, award-winning author Elizabeth Partridge's unflinching book captures the intensity, frustration, and lasting impacts of one of the most tumultuous periods of American history.